Some time ago, I posted about “The Greening of Lent”, where environmentalists gave people the charge to reduce their “carbon footprint” during the 40 days before Easter. Now, the kooks have moved their attention to Halloween costumes and fall festivities to deliver their politically correct message. If the thought of skeletons, zombies and angry clowns coming to your house tonight for free food makes you tense, you’ll be happy to know there are some new creatures that may be coming to your door. The Department of Energy is encouraging potential ghosts and goblins to dress as alternative energy sources. It’s true. As if they have nothing else to concern themselves with, you may get to see kids dressed as wind turbines, solar panels and maybe even as the head of the department, Ernest Moniz. Not sure what’s scarier: a child who would want to dress in these costumes, or a child who actually knows who Ernest Moniz is. However, they do mention some actual good news. This waste can be used as bio-fuel that could help the country become less dependent on foreign oil (as if we really have to be anyway with all of the natural gas we have), but that’s another topic for another time. The Department of Energy doesn’t seem to discourage the carving of pumpkins, however. As with the costumes, they just encourage you to carve something energy efficient into them, such as the previously-mentioned wind turbine, a curly CFL light bulb or the shape of an atom. So if dressing up as a windmill doesn’t interest you, maybe you can just carve one into a pumpkin, set it out on your porch and then all your neighbors will know that you care about the planet. This is confusing…like the jack-o-lantern, the “Energy Pumpkins” too will end up in a landfill until such time as the technology and resources are in place that can convert them into the bioenergy of which the bureaucrats at the DOE speak. So, given the choice between some boring costume or pumpkin carving, most of us prefer to stick with tradition…so fire up the jack-o-lanterns! There’s still more than a month to go until Halloween, but that didn’t stop the weirdos, scary people and assorted kooks from making headlines this past week. Climate change/ global warming believers took to the streets of cities across the U.S. and around the world in an effort to pressure world leaders at the United Nations to “do something” about the climate that they say is too warm. Too warm where, and for who or what, no one ever seems to explain. What is this optimal, worldwide temperature that is perfect for everyone, everywhere and at all times? They don’t know and it doesn’t matter. What does matter is that they feel like they’re doing something. That something usually involves downsizing America in some way. For instance, some of the relics who participated in the “Peoples Climate March” in New York stayed the next day so they could “Flood Wall Street” because they believe the cause of climate change is “unchecked capitalism”. In fact, these marches around the world were largely communists, socialists, anarchists, people who hate the police (that’s the profession, not the rock band) and some concerned folks who really do care about the environment. Speaking of Police (the band, not the profession), environmentalist and musician Sting was there, as were actors Leonardo DiCaprio and Emma Thompson, who made this proclamation: “Unless we’re carbon free by 2030 the world is buggered”. She may have failed 8th grade earth science, because if carbon dioxide ever goes the way of the dinosaur, there goes all plant life as we know it…that would leave us all “buggered”. No climate gathering would be complete without an appearance by the High Priest of the Church of GlobalWarmingClimateChange himself, former VP of the US, Algore. Gore was fresh off a speech on his favorite topic a couple weeks ago that left many laughing at what appeared to be Divine Intervention inserting itself into Al’s fiery tirade. Just as he began quoting a passage of scripture from the Book of Luke, Gore’s microphone cut off on a most interesting word…”hypocrites”. Hypocrisy seems to be a common thread among progressives, particularly on this topic of climate. They support wind turbines, but only near your home—not theirs. They don’t want you to drive an SUV, but they can cruise around on private jets on a regular basis. They want you to pay higher energy bills, leaving you with less money for extras. But they won’t be scaling back their lifestyles anytime soon. In the cases of the names previously mentioned, they’ve already made their money, so intrusive regulations and higher bills don’t bother them. They rail against capitalism, and promote every other “ism” even though capitalism has been very good to Sting, DiCaprio, Thompson and Gore. Very, very good. They despise fossil fuels and carried signs and wore t-shirts as they marched decrying our dependence on them. Yet they failed to see the irony in that the entire event wouldn’t have been possible without them. Hundreds of thousands of people had to take transportation that, for the most part, was powered by gas and oil. Even those who took electric cars to the march were driving on fossil fuels, since so many car parts are made with plastic—another product of fossil fuels. Forbes.com columnist Alex Epstein wrote an excellent response to those who felt the need to march last week, and to those world leaders at the UN that are more than happy to respond to their requests for worldwide taxes on the use of oil, coal and natural gas. He gives 6 reasons why limiting fossil fuels will hurt the planet and the downtrodden people the marchers say they want to help by eliminating their use. Epstein points out that if the use of fossil fuels is denied to developing nations and to future generations, “we will have blood on our hands” because lives will be cut short around the globe. He goes on to give this important fact: “There is not one modern economy in the world that is powered by solar and wind, because they are inferior, unreliable sources of energy.” The useful idiots marching in the streets may think the world would be better and more peaceful if we just weren’t using fossil fuels, but they never explain what more efficient, affordable alternative is out there. They also never explain where all the electricity will come from—in the absence of oil, coal and natural gas—that will be able to power all of the electric cars that they hope everyone will be driving in the next ten years. Are you still doubting that Green is the New Red? Halloween comes early: People’s Climate March protester proving that it’s not about climate. Perhaps the biggest untold news story of 2014 has already happened—and the year is barely a week old. If you rely on the mainstream American press for your information, you probably heard something about a group of “tourists” who were stuck on a boat surrounded by ice in Antarctica recently. These weary travelers were, fortunately, rescued…and that’s a good thing. And then the rescuers had to be rescued by a small ice-breaking vessel of the U.S. Coast Guard. That’s what you would have heard from the alphabet soup of media talking heads, and you may have been wondering: why would anyone go “touring” or “cruising” in Antarctica? Of course, no one would, unless they were on a mission…and that’s the part of the news story the American media completely dodged. You would have had to go to an overseas news source early on to get the real story—the “why”—because calling those folks stuck in ice “tourists” is about as believable as Gilligan, Mary Ann, Ginger and The Rest bringing everything they owned on a three hour tour. Apparently, it isn’t disappearing quickly enough. Though it’s summertime in Antarctica, the hapless true believers of man-made global warming were stuck on ice from Christmas Eve through the New Year holiday. As New Years’ revelers shivered in frigid temperatures in Times Square, the researchers on board Akademik Shokalskiy ushered in 2014 by singing a song they made up about their misadventures. This week has seen most of our nation gripped in the jaws of the ominous-sounding “polar vortex”. Although this is not a new weather phenomenon, the mainstream media couldn’t seem to get enough of it, making it sound as if we’re seeing things that haven’t happened before because of man-made global warming. The White House came out with its own video to attempt to defy logic with its “the-earth-is-still-on-fire” alarm “The Polar Vortex Explained in 2 Minutes”. Basically, the guy in the video tells us not to believe our own lying eyes (and frozen other parts) because this polar vortex proves the earth is really getting warmer. These people need to get their stories straight. Either the earth is warming or its cooling, but it can’t be doing both—in all parts of the earth, at the same time. For a more scientific and level-headed look at the recent cold snap, check this out. The news media should be focusing on other things rather than why winter is cold and summer is hot. But certain things they must hide—like the mission of the Antarctic ship stuck in ice. As the public relations arm of the current control-obsessed White House, the “WHY?” of that story makes them look even more ridiculous than most of us already believe them to be. I would be remiss if I didn’t mention the terrorist attack that was perpetrated upon the city of Boston last week during the Boston Marathon. This post isn’t about that. I think many others have been and will continue to do a much better job covering that constantly-changing story than I’m able to do here. My heart and prayers go out and up for those family members of the three people killed, and to all of the many victims whose lives were forever changed last Monday. God bless all the police officers, emergency workers and others who helped save lives, as well as those who worked tirelessly to capture the suspect who remained alive at the end of the week. Like his predecessors, former Vice President Al Gore has certainly made a comfortable living hawking the global warming/ climate change message. The Profit of Doom (pun intended) has made a number of speeches over the past several years predicting the polar ice caps would be completely melted within five years. From what I could find, he first mentioned this in 2007, so they should be gone by now, or at least getting pretty close to being gone, but I’ve not found any information to back that up. Probably because it isn’t happening. If it were, the media would be all over it. By the time a child graduates high school, they are well-versed in the green movement. Their minds are then fertile ground for growing the mostly anti-American, anti-capitalist mindset so prevalent on college campuses large and small. “Do something!” they’re told, from grade school to college. “Something” always seems to involve more government interference in the lives of people. It’s one thing to take care of the earth and to be good stewards of what God gave us. That can include not littering, recycling, conserving water and turning off the lights when you leave a room. But it can also include using our natural resources that we have here in our own country (oil, natural gas, etc.) to make our lives and the lives of others around the world better. Using our natural resources is not the something that those in the green movement would have us do. In fact, many attempts to do so are usually blocked by powerful environmental groups, who have lots of money behind them…and they’ll give that money to those in Washington willing to do their bidding. 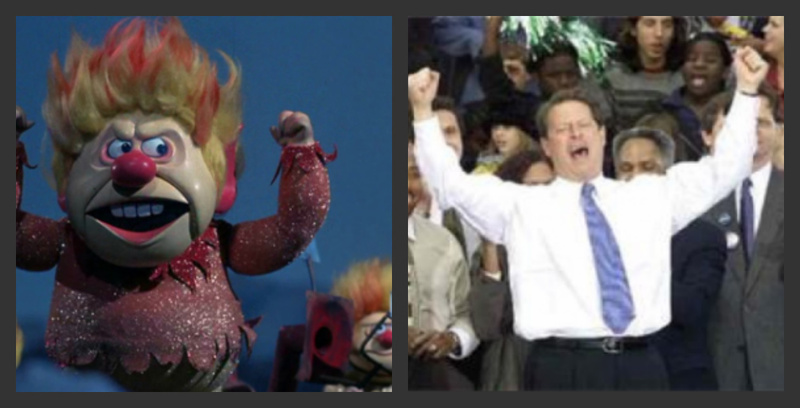 Separated at birth- Climate change huckster/ millionaire Al Gore and The Heat Miser character from a classic Christmas cartoon. It’s too bad that Easter falls so late this year that Good Friday has ended up being on the same day as Earth Day (April 22nd). While many of us will attend church services of some kind in order to remember the focus of the day, Jesus Christ, and His death for our sins, others will focus on “Mother Earth”. In another example of a bunch of people who just want to feel better about themselves for whatever reason, the Earth Day 2011 website gives everyone the opportunity to get in on the act. Yes, you too can be a part of A Billion Acts of Green! *changing out your light bulbs…You mean to those curly ones that contain more mercury than the can of tuna fish they told us we shouldn’t eat a few years ago? *circulate an anti-coal petition…Oh, yeah, good one. Coal only provides nearly half of the electricity that we use…how will we power all those electric cars they want us to drive around in? *Ask your clergy to have an Earth Day sermon…And I would hope he would then pray for me immediately, because I know for sure that my pastor will not be focusing his words on Good Friday on saving the earth, but on saving the souls of those who live on the earth. *Plant a garden at home or school…Actually, this is a pretty good idea. We’re all going to need to have our own food sources because at the rate that food prices are increasing, no one will be able to afford to go to the grocery store, or the gas to get there. Not to mention the fact that we are burning our food supply to make the government-mandated ethanol to put in gasoline, causing food shortages in poorer countries that rely on us to help them. But that’s another, though not unrelated, story for another time. If you don’t believe there’s a much darker agenda for many “environmentalists” than just taking care of the earth, look no further than Bolivia. Last week, that nation proposed to the United Nations that the UN recognize the Earth as a “living entity that human beings have sought to dominate and exploit”. The bogus resolution would give the earth the same rights to “life” as human beings. It is meant to mirror Bolivia’s Law of the Rights of Mother Earth, signed by Bolivian President Evo Morales in January. It’s important to note that Morales, at a UN summit in 2008, circulated a pamphlet laying out his “10 Commandments” for Bolivia’s plan to save the planet. The first commandment was the need “to end capitalism”. It’s also important to note here that Bolivia is one of the poorest nations on the face of the earth, in spite of its vast resources, namely lithium, which is used in batteries. If only they would start worshipping the Creator instead of creation, how their lives would change for the better. Incidentally, the UN recently backed off from its October 2005 prediction that there would be 50 million global warming refugees by 2010. With a track record of failure and inaccuracies, it’s amazing that so much American taxpayer money still goes into the money pit that is the United Nations. I’ve been away from my blog for a few weeks due to writer’s block and a trip home. Most of the time, I drive the nearly-740-mile trip to the town where I grew up, which takes anywhere from 12.5 to 14 hours, depending on road construction, traffic, weather and my own tiredness. So, being someone who likes to take road trips, I was slightly interested when I heard this week that Chevrolet is finally taking orders for the new Volt, an electric car that has gotten a big build-up from the media, environmentalists and the president…you see why I was only slightly interested? Glowing comments from those mentioned above mean that something is probably a total bust…and it is. The Chevy Volt will cost $41,000 (unless you take the $7,500 tax credit for buyers of electric vehicles), and will get—wait for it— 40 miles on a full charge of its battery, plus an additional 340 miles on a gasoline-powered generator. My drive to work and back alone would be enough to cause the Volt to have to use the gasoline. The good thing is, from what I understand about the Volt, it does have a way to re-charge the battery while you drive using the gasoline generator, which is what makes it different from other plug-in cars, that take hours to re-charge. The bad thing—it uses premium gasoline, so you’d be paying the top price when you need gas. Just as a way of comparison, the 2010 Honda Civic I rented to make my drive home allowed me to go about 400 miles on a full tank of regular gas. They cost less than $20,000. My own car, a ’99 Prizm, still gets about 350 miles per tank when the tank’s full—and that car cost me less than $10,000 when I bought it almost ten years ago. Needless to say, I won’t be in the market for an electric car of any type. Even with the tax-payer-funded assistance to buy it, the Volt isn’t likely to be seen with any regularity in most middle class neighborhoods anytime soon. People still like their SUV’s and pick-up trucks. According to a news report I just heard, sales of large vehicles were up by 19% in the first half of this year, compared to 14% for small cars. This from the man who flies everywhere on a gas-powered private plane, gets chauffeured around in gas-powered limos, is pictured on every trip he takes stuffing his face with some local fare, and cranks the heat in the winter in the Oval Office. So typical of this “do as I say, not as I do” administration. Inefficient and Expensive: ...and the car's not so great either! This is the only time you'll see Mr. Prez in one of these things. 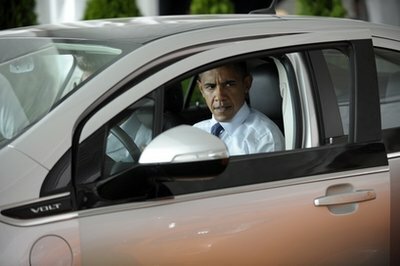 He also promised to put 1 million plug-in cars on the road by 2015. But, if he gets his Cap and Trade energy scheme going, that will put many coal mining companies out of business, and since we get nearly half of our electricity from coal, where will the electricity come from to power all of these wonderful cars? No one wants to see every rural field filled with windmills (which are known to be noisy and destroy wildlife), and Niagra Falls isn’t even big enough to generate the power needed by 300 million people every day. This is just another way the elitists in our government hope to make us more like Europe. They drive tiny little cars there, pay upwards of $6.00 a gallon for gas, and live very close together. I’ve said in previous posts, we are NOT Europeans. We are still Americans, and we like the freedom of driving where we want and when we want, and we really don’t want anyone to tell us what kind of car we should drive. If these Volts and other such vehicles were the wave of the future, the government wouldn’t have to bribe people through tax credits to get them. For nearly two weeks now, the world’s elitists have been gathering in Copenhagen, Denmark in order to solve the world’s “global warming problem”. In other words, they discuss how to pilfer more money out of the USA under the guise of saving the planet from utter destruction. As they fly their private jets and are chauffeured in their limousines to the climate change summit, the snow falls…and falls…and falls. This week’s freezing weather greeted the president as he showed up for the tail end of the Copenhagen Farce. The Danish capitol was blanketed by four inches of snow on Thursday, and more is expected in the next few days. Apparently, this isn’t their normal December weather forecast. An official at Denmark’s Meteorological Institute said, “There’s a good chance of a white Christmas.” Denmark hasn’t had one in 14 years, and has only had 7 in the last century. Things haven’t been going too well for ‘ole Al lately. 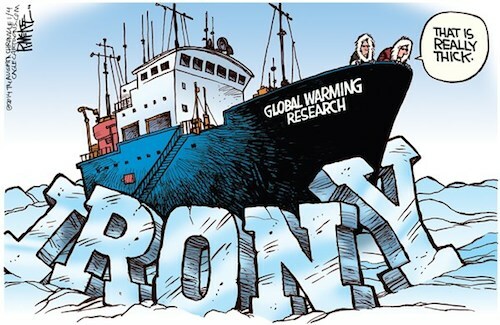 The revelations made in the “Climate-gate” email scandal caused a couple of the more conservative members of the American Academy of Motion Picture Arts and Sciences to call for his Oscar to be revoked after the emails revealed leading global warming scientists had fudged numbers, and held back information that would be detrimental to their case. Several MILLION degrees? Wouldn’t that make us a star like the sun? Would we even be able to live on the face of the earth if the center were that hot? Common sense tells me “no”, but then, I’m not scientist…and neither is he. Then there was the whopper he told his audience in Copenhagen. According to the UK Times, he told them the “latest research” predicts the Arctic ice will melt within five years. He was basing this claim on the work of a Doctor Wieslaw Maslowski, who quickly pointed out that he was wrong. He said Gore was using old numbers that had been “tossed about in conversation” many years ago. So, as the Heat Miser piles on the gaffs, the snow piles up in Copenhagen…and in Washington, DC. In fact, the president, who stayed a few hours longer at the summit than he planned, left before a final vote on any kind of climate change treaty. The reason? He had to get back to DC because of the severe winter weather moving up through the eastern seaboard this weekend. His speech in Copenhagen left the greedy Third World dictators cold too—because, surprisingly, he didn’t “put more money on the table”, as one slimy delegate said. They shouldn’t worry, though. Hillary Clinton did. 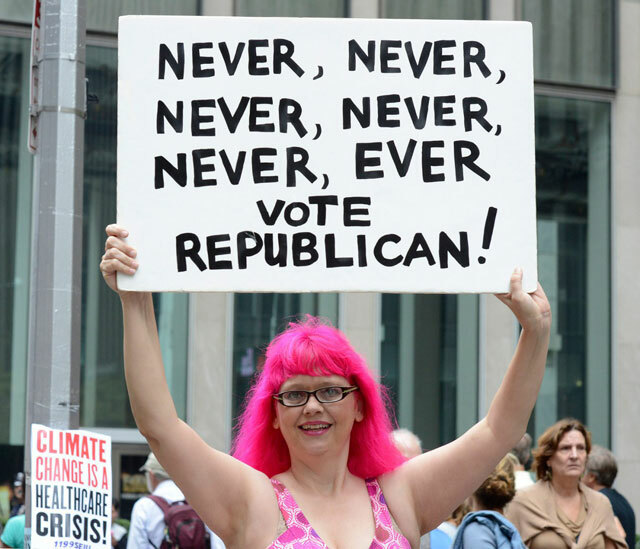 She promised to redistribute 100 BILLION dollars of American wealth over the next ten years to these people who hate us. Boy, when she piles it, she piles it high! Everybody grab a shovel—it’s about to get deep.